A workshop machine that drives abrasive wheels and other accessories. 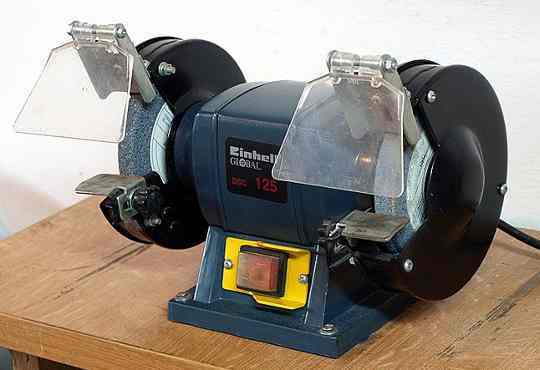 Used for grinding, sharpening, cleaning and buffing. Also known as a pedestal grinder. An essential workshop machine. There are a huge amount of wheels, discs, wire brushes and buffer pads available for these versatile machines. My old machine always has a green grit (silicone carbide) wheel on one side for sharpening TCT masonry bits. 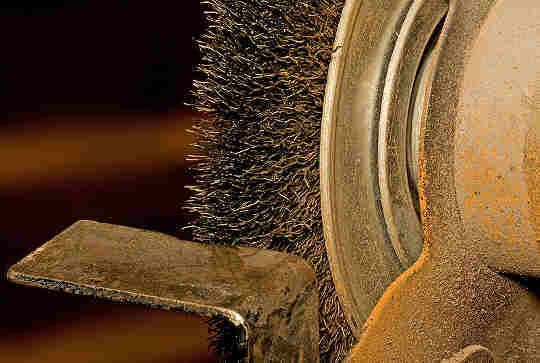 Here are a few things to look out for if you are looking to but a good bench grinder. MUST HAVE the main safety features of easy on off switch, eye shields, (though you should always use a personal face mask or goggles and a sturdy but adjustable base for supporting the material. The base should be adjusted to around no more that say 1/8" or 3mm from the wheel. One of the features that I like in the modern grinders is the use of variable speeds which means they will be excellent for grinding tools with less risk of burning them. As with most modern machine tools a good adjustable light is essential. Depending on how much changing of wheels is done then a quick change feature may be worth while. Be particularly careful when using these machines. They have high speeds and any misuse can cause wheels to shatter. Never use a grinding wheel if you have dropped it. When using wire brushes like above a try to always use a leather apron and gloves as these wheels shed wires very easily.